This is a strange beast. It's largely a collection of traditional Irish songs that would normally relegate it to the trad ghetto with all other albums of the like. However, from the start of the first track, 'Black is the colour', that this is obviously different. 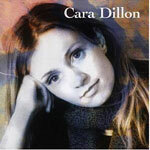 Musically, the Sam Lakeman produced (and largely performed) sounds are a lot closer to indie folk acts than your local ceil� band, while vocally Cara's singing is a unique mix of a traditional Irish ballad style and a certain red-haired songstress. In fact, to describe this as sounding like a Tori Amos-fronted 10,000 Maniacs running through an obscure old Gaelic ballad book. However, it's in the uniqueness of that combination that the appeal lies. Where it falls down is, after the first four tracks or so, they've shown what they can do and the CD starts to drag. The two self-penned tracks, 'I wish I was' and 'Blue mountain river' don't stand out at all. Ms Dillon and Mr Lakeman show a lot of talent and imagination, but they have played it somewhat safe here. Hopefully they'll be given the opportunity to cut loose a bit more next time.